This is my second pack after creating the succesfully easter pack, i hope you like this as much or even better. What is this Summer Life thing? 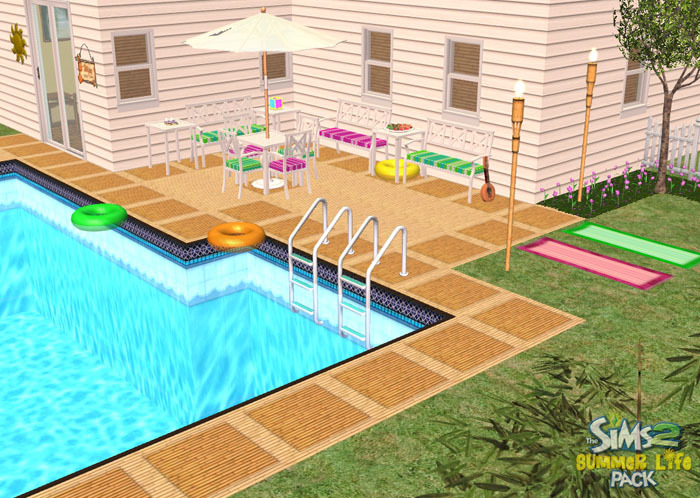 -The Sims 2 Summer Life Pack by Simfantastic 2 is free for people who own the Sims 2. No matter what Sims 2 game you have it will work with it. If you have all of the expansion packs, 2, 1, 3, none, or what ever number this FREE add-on will work. Yes that is right all of this stuff is completely 100% free! You are one click away from downloading summer themed items! What do I get if I download the Summer Life pack? -The Sims 2 Summer Life includes a lot of content including, music, objects, clothes, walls, floors, and collections. There are no new interactions though. This is quite some custom content since it is like a bit smaller stuff pack, but it is unofficial. The pack includes over 320 things to dazzle on and if you count the re-colors it has over 475 new things! You get so much customization here. (Including walls and floors) The pack has 41 new objects, 48 new clothes, 106 new floors, 129 new walls, 23 new songs, and 156 re-colors of the new objects! How long did this take to make and can I download more stuff like this? 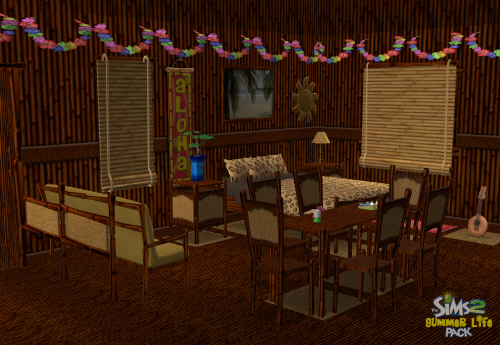 - First I thought of an Idea of making my own pack for the community to download in December of 2005, and I wanted people to celebrate for the Easter Season, which is why I started on that date to create The Sims 2 Easter Pack, which was a wonderful success. So that is available for you to download also. That took three months to make and this Summer Life Pack took a bit lower than 4 months. I now spend three to four months on my packs and it is a lot of work, and it sometimes takes me away from updating my regular site, but I like the way it is once the pack is finished! Note I am just 14 so I still did have school so between homework and school I had to squeeze all of this in also to meet a deadline, as you can see it was successful! I hope and think more people will download this than the Easter pack since Easter is based on a certain holiday that not everyone celebrates, but summer is something almost any one can relate to. I am most likely going to make more packs in the future but I am not quite sure what theme should be next. I was thinking Halloween but I don't want to start a new pack quite yet and I wouldn't have 3 months to work on it. So I might make a Mini-Pack for Halloween and then start a winter one, you never know what might happen. Just one more thing before I think I can download? Are you sure this is free? The button is also on all of the object pages If you do donate thank you very much! Can I send this pack to my friends and at other places online? (Sorry to mts2 to linking to my site again, there are too many images.